Week End Blog – With China, Russia and of course… Apple! Lots of China news in the Week End Blog. 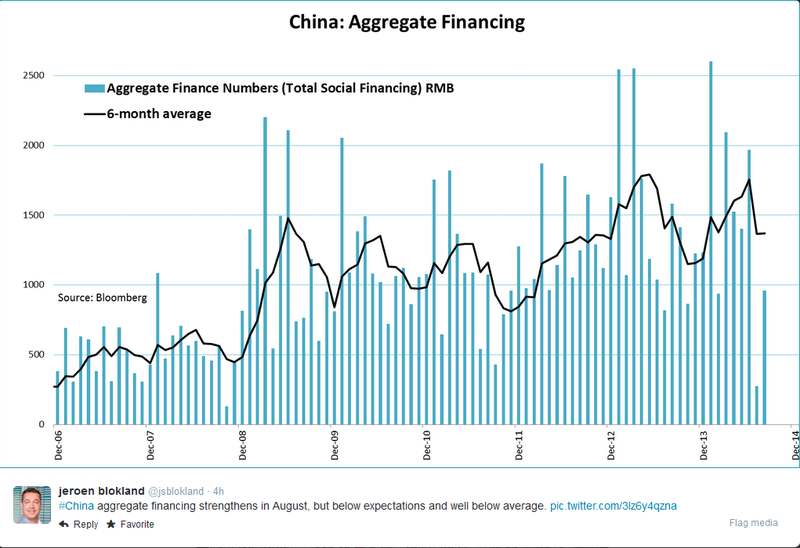 After a total collapse of new loans in July, aggregate financing strengthened somewhat in August. But, the change that occurred in the last two months is striking and makes you wonder how GDP growth is really doing. Also below expectations was M2 money supply growth. While money supply is also linked to GDP growth, investors will probably have mixed feelings as well when confronted with the graph below. 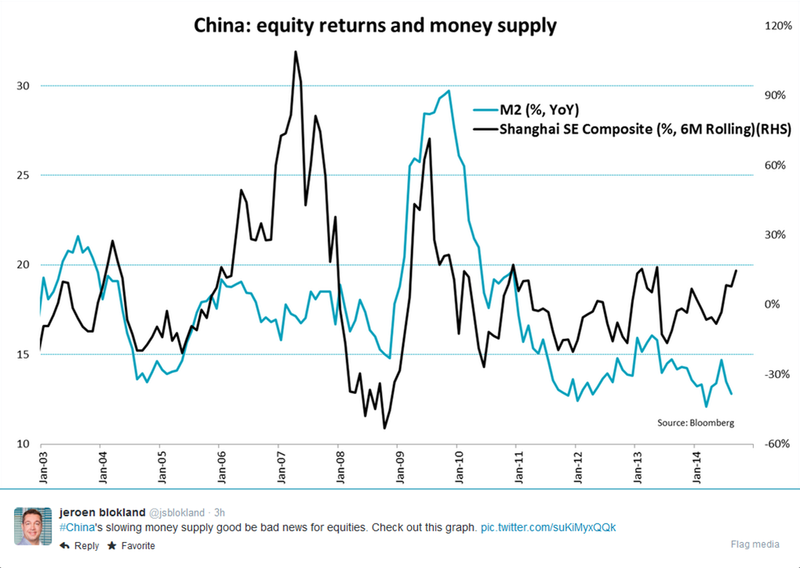 Over time there is a loose relationship between money supply growth and rolling equity returns. The two are diverging for the worst for quite some time now. 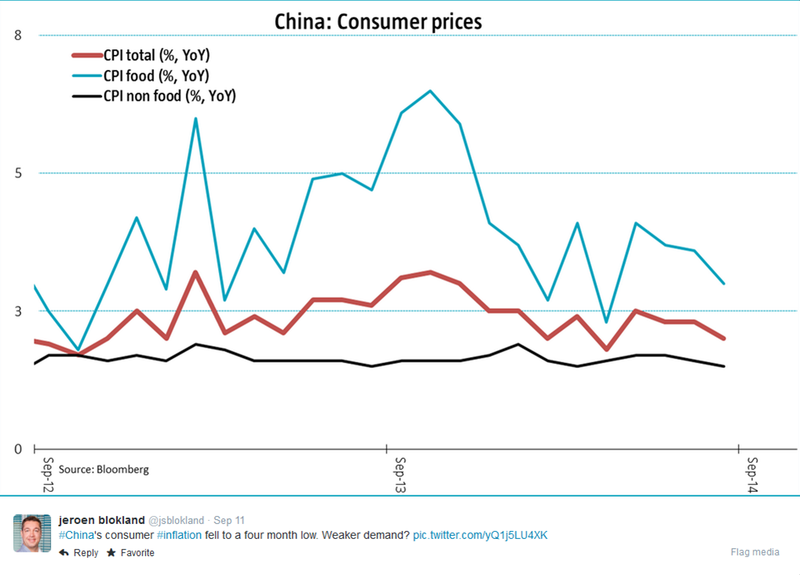 China consumer prices rose less than expected in August, which could be a sign of slower demand. That said; a slower rise in food prices added significantly to the lower inflation number. There is at least one beneficiary of the sanctions imposed on Russia. 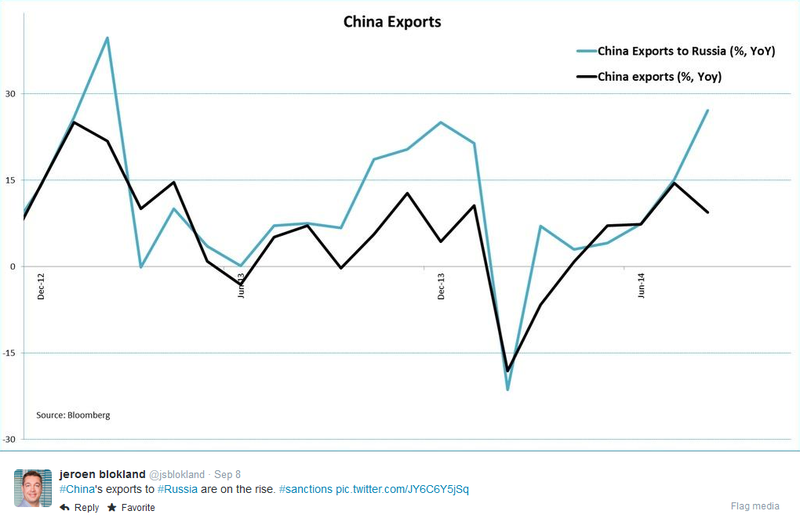 Chinese exports to Russia rose 27% YoY. Talking about Russia. Things don’t look to good over here. Yes, there has been some attempt to reach a cease fire, but the passive attitude of Mr. Putin to resolve the issue is enough for Europe to start a new round of sanctions. 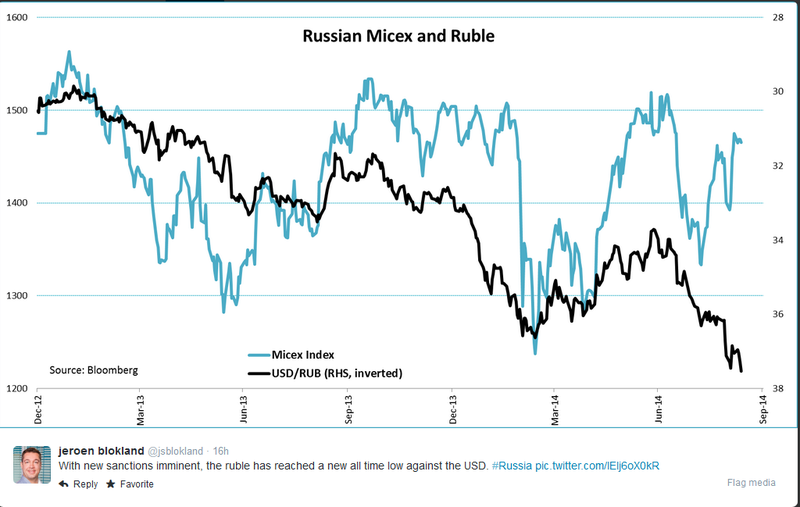 The ruble has made a new all-time low in anticipation. 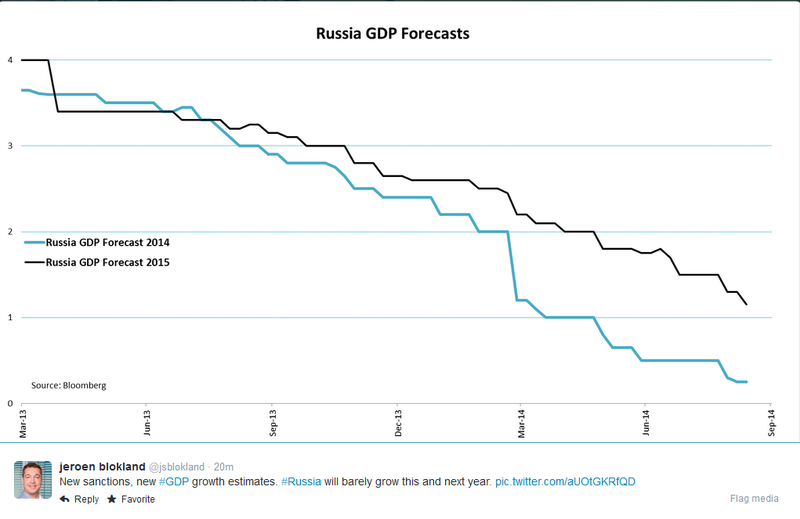 The obvious result is that Russian GDP growth expectations are coming down, again. Meanwhile in Europe, the worst seems to be over for now. 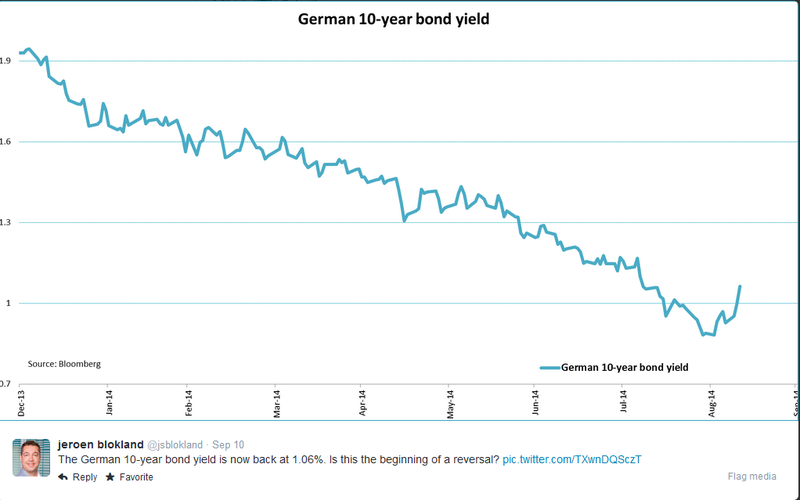 The German 10-year bond yield actually managed to get above the 1%-threshold again. As in last week, macro numbers came in a little better than expected. 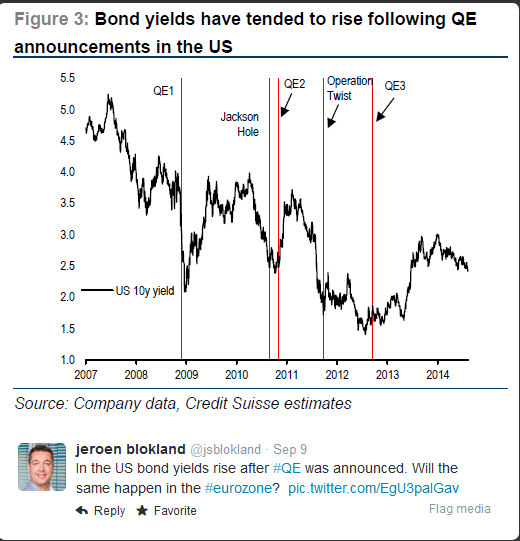 Another reason for the rising German bond yield could be the ‘buy the rumour sell the fact algorithm’. As the graph below shows the US Treasury yield started to rise every time QE was announced. Perhaps not outright QE, but announcing that you will blow up your balance sheet by up to EUR 1000 billion does seem to have the same characteristics. 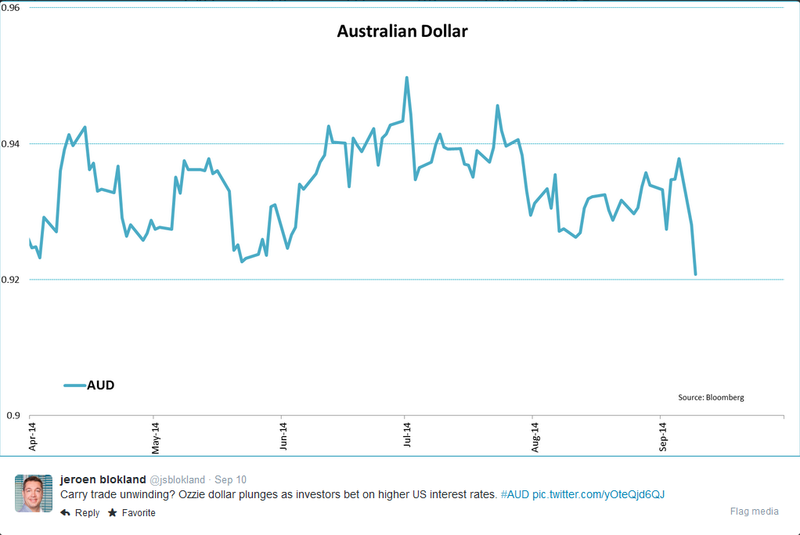 This week, the Australian dollar depreciated in a rather rapid fashion. The same goes for the Japanese yen. After being range-bound for months the yen fell by more than 5% since the beginning of August. Remarkably Japanese stocks have not outperformed. 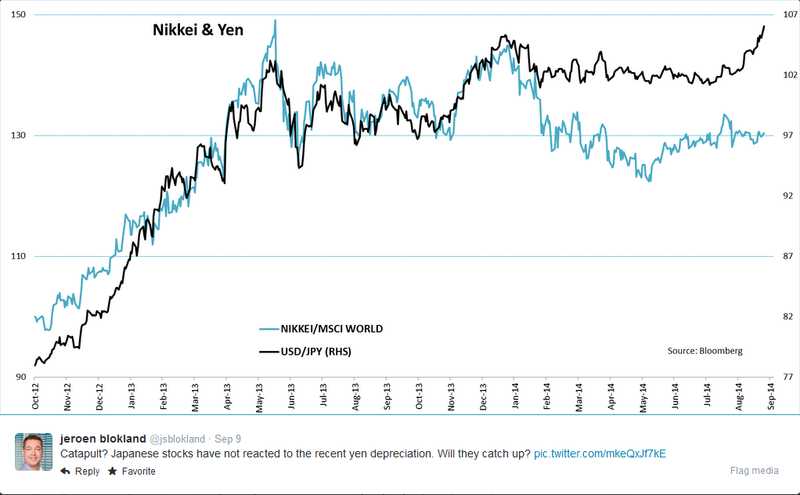 Since the financial crises the relationship between yen depreciation and Nikkei outperformance has been pretty significant. But so far not this time. Perhaps investors are not convinced the yen weakening is followed by another round of QE by the Bank of Japan. This Week End Blog can’t do without Apple. It never ceases to amaze me how much this company is followed by, well pretty much every everybody. My Twitter timeline became an ‘Apple timeline’ this week. Check out the iPhone 6 and Apple watch yourself and try to answer this question? 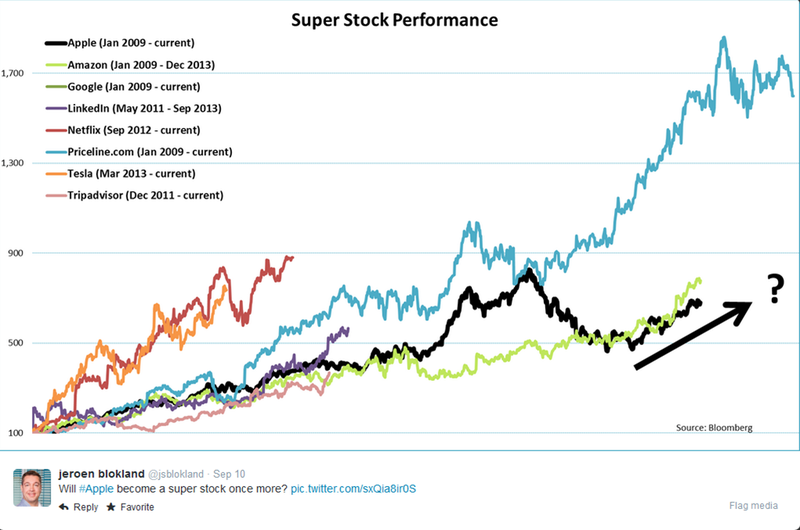 Will Apple become a super stock once more? PS. 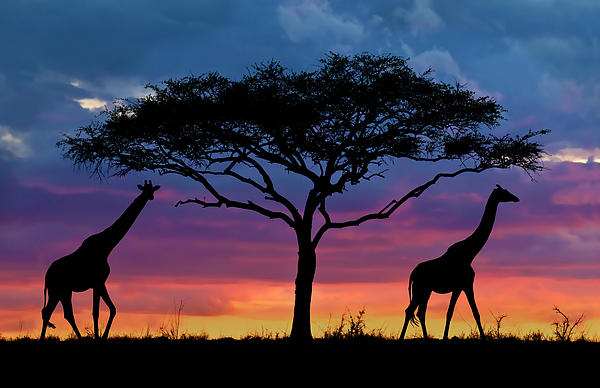 No Week End Blog the coming two weeks as I will be visiting the beautiful country of Tanzania.